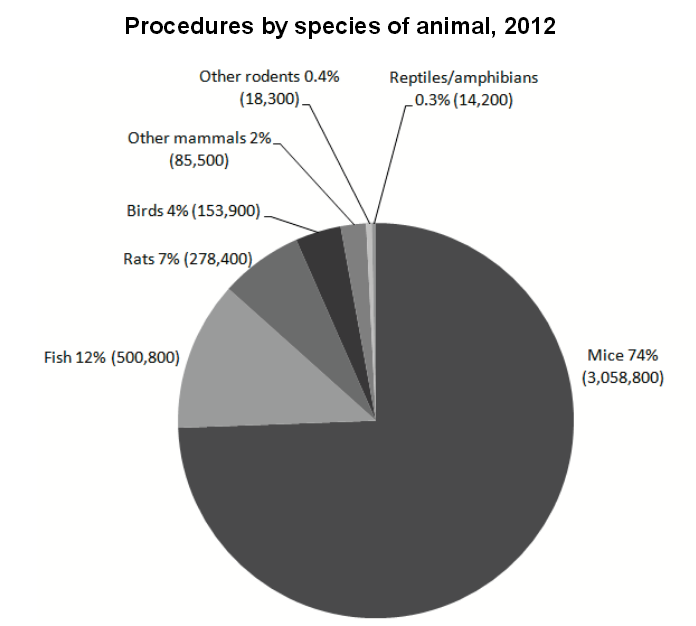 Every year the UK Home Office publishes statistics showing the number of procedures carried out on animals covered by the Animals (Scientific Procedures) Act, 1986; this covers all vertebrate species. Overall, the number of animal procedures rose from 3.79 million to 4.11 million animals (an 8% rise), while the number of animals,a small number of which are used in more than one procedure, rose from 3.71 million to 4.03 million animals (9% rise) . Overall, 97% of procedures were carried out on mice, rats, birds or fish, while dogs, cats and primates (which are offered special protections under UK law) combined, remain under 0.2% of the total. The number of non-human primates rose from the previous year, however a sharp decline last year means 2012 remains the second lowest number of primates were used for many decades, and continue a general downward trend in their use. Understanding Animal Research have covered this in more detail (with graphs) on their blog. A ban on cosmetic testing on animals (1998) and of using great apes (gorillas, orang-utans and chimpanzees) in research (1986) meant both had 0 procedures in 2012. Similarly, efforts to phase out tests on household products meant that for the second year running, no animals were used for this purpose. 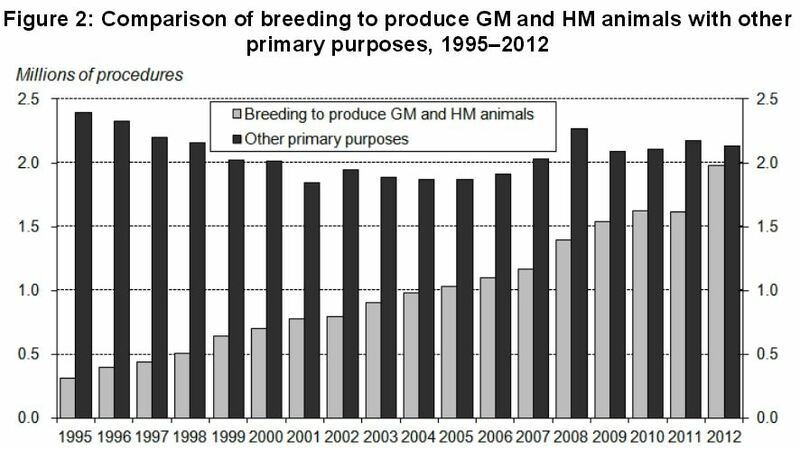 Much of the rise is attributable to the 22% rise of procedures to breed genetically modified animals (including harmful mutations), which now account for almost half of all experiments. This rise reflects the increasing use of genetically modified animals to better model human and animal conditions. The statistics also fail to show the significant advances being made to improve the welfare of the animals that continue to be used – real differences that affect the lives of millions of animals, not only in the UK but also elsewhere. Animal research plays a crucial part in the developments of modern medicine. This year has seen breakthroughs such as treatments for the deadly genetic disorders metachromatic leukodystrophy and Wiskott-Aldrich syndrome, as well as Progeria (which involved genetically modified mice). The rise in animal research today may well help provide the medical breakthroughs tomorrow. Posted on July 16, 2013 by EditorPosted in News, Outreach News, Science NewsTagged animal research 2012, Home Office statistics, how many animals are experimented on, number of animals in research, number of animals tested on, UK animal research.